We know this is true, girls just want some fun. Cyndi Lauper had it right. But what does the new cabal of economists want? Seems like there is a not so secret cabal of them, maybe lead by Scott Sumner, and they come from the University of Chicago, or have friends from there, and study neo-Keynesian thought and Libertarian thought. So what do they want? Well, although they are complex thinkers, figuring out some of what they want it is doable. They want unlimited, or nearly unlimited, and unbridled economic growth. That is an oversimplification of course. They no doubt require a set of circumstances for this growth to happen, and they may even disagree on what those circumstances should be. They don't seem concerned with economic bubbles and even seem to deny they exist! 2. Kevin Erdmann, who believes that my most recent article was flawed due to not engaging in the fact that Stockholm has strong housing anti growth policies in place that are key to driving up prices. I knew that, but didn't place that into my article because I know Stockholm won't change. And San Francisco won't change the character of the city to drive down house prices. It isn't going to happen. 3. Nick Rowe, who is way too smart to be bogged down in economics. 4. John Cochrane, the Grumpy Economist who really isn't grumpy, former professor of the Chicago Booth School of Business, who has a dim view of zoning and land use regulations. These are just a few of the economists seeking nearly unfettered growth. Some are Neo-Keynesian and some are Libertarian or perhaps something hybrid those lines. They are all bright guys. They can be grumpy. They are on the cutting edge, and I respect their study and find them quite interesting, but they raise red flags for me. Now, I can tell you that I oppose austerity and also oppose toxic loans. 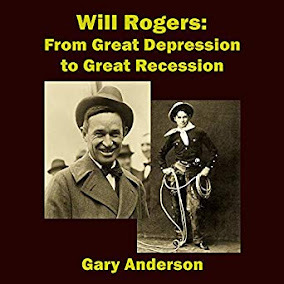 I can't speak for those guys mentioned above, but they might say austerity is caused by land use restrictions and tight lending standards, and you need to get rid of those. I am not so sure I want to, but something has to be done about austerity. We know what happened to many borrowers who received toxic loans. Those loans caused massive familial instability and really bad stuff like abandoned pets, divorce and even murder! Some places crashed more than others. As far as unfettered land use going forward, it just so happens that San Francisco and Seattle are on earthquake faults. Building upward seems like an unacceptable risk in both of those cities. If the pro growth planners want to ruin Boston, have at it. You can't drive in that city unless you have an IQ of 160 anyway! Build it to the moon, guys! But of course, Boston will never allow that either. I know Scott Sumner, from his FAQs link at the top of his blog, the Money Illusion, clearly is not seeking huge disruptive measures. He thinks that banks would lend more if the interest payments to the banks by the Fed were removed or even a small negative penalty applied to those reserves. He seems to be for small and cautious changes to see how they play out. At least that is my take. I don't disagree something needs to be done. I hoped to amuse there, but where it gets ugly is regarding the banks and toxic loans. Again, I can't speak for them, but it seems as though they would view banks as being too regulated. Maybe they are now, but they weren't that way in the housing bubble. They could qualify any guy with a pulse, and ship the loan off to securitization. Underwriting went away. I wonder if they long for those days? They may even seek the perpetual lending we see in Sweden. Their system generally fails when house prices get too expensive. I think they don't want fetters on easy money lending, or on any physical fetters stopping development. With limits on growth that are not going away, toxic loans push real estate prices up very quickly, and danger lurks. One thing the cabal doesn't seem to focus on is the massive demand for long bonds as collateral in the derivatives markets. I think they staked out a course of action without studying the implications of the new massive long bond demand. I think it is a subject that could impact their ideas and growth in America. I have written a few articles about this issue, found here. I want austerity to end, too, and for the US to grow, But long bonds as collateral surely will get in the way, if their yields remain tied to the mortgage market, perhaps even more than your local zoning laws. 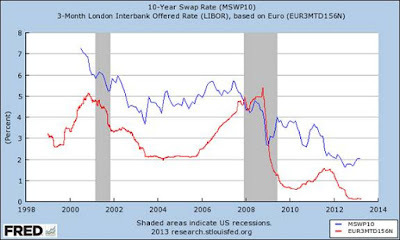 It seems to me that the long bond will get in the way of allowing too much stimulus of excess bank reserves, as the banks have bet on low interest rates and the Fed can't allow Libor to cross the Swaps rate as happened in the crash. (See Chart Above.) These economists really need to study this and not ignore it as most are doing now. We don't need Libertine economists not taking into account all the variables! It is my view that if interest rates on the long end are higher, banks may want to make more housing loans. I don't think the cabal agrees and some may seem satisfied if rates are negative, forcing banks to lend. That could work, but it is uncharted territory, and could have unforeseen negative consequences. Will Fed and Central Bankers Give Up Alchemy to Save the World?